During our week long stay in Tokyo the bustling capital of Japan, we took a day trip to the popular town of Hakone. We were hoping to catch a glimpse of the famous Mt Fuji. Because leaving Japan without seeing Mt Fuji would be a real shame. We’d seen so many amazing photos of this imposing mountain that we couldn’t wait to finally set eyes on it for ourselves. 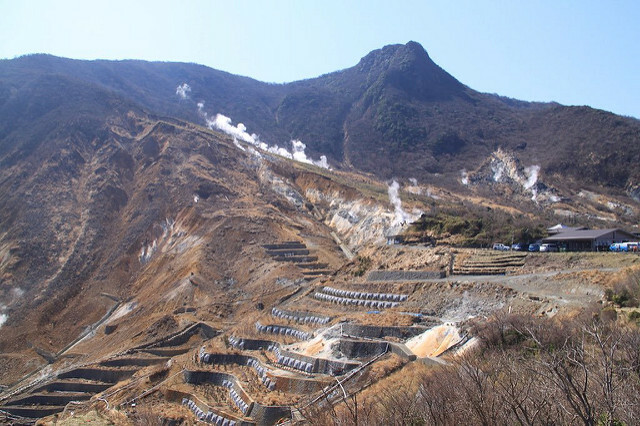 From Tokyo, you can book an organised tour to Hakone but we preferred to tackle it ourselves. We wanted to go at our own pace and to visit only the places that interested us. So we decided to purchase the Hakone Free Pass. What is the Hakone Free Pass? The Hakone Free Pass is a discount rail pass offered by Odakyu Railways. 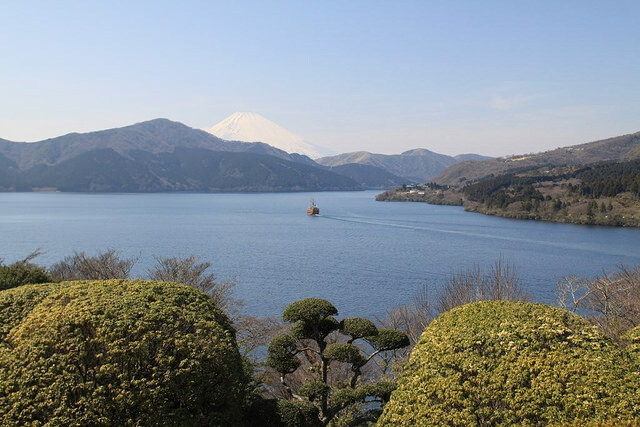 It is the perfect pass for exploring the area around Hakone on your own. 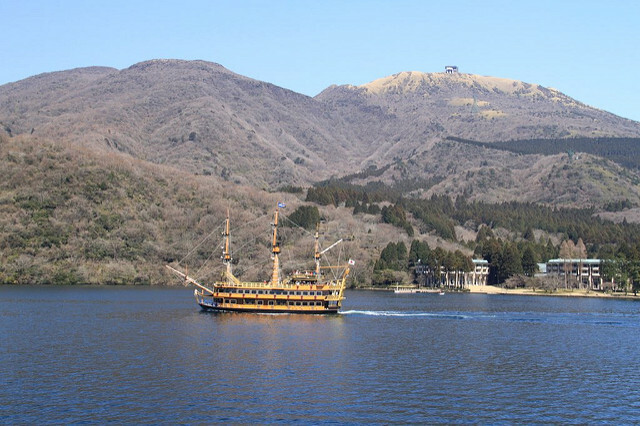 It gives you unlimited use of Odakyu-affiliated buses, trains, boats, cable cars and rope-ways across the entire Hakone precinct, and you can purchase it for either two or three consecutive days. Sadly we only had one day to do it all but we still managed to make the most of it by starting really early in the morning. Passes cost 5,140 Yen for a two-day pass or 5,640 yen for three days. We bought ours from the Shinjuku train station but you can also buy them at any Odakyu Railways ticket office. Their main office is in Shinjuku and as we happened to be staying nearby it was perfect for us. For more info on the pass check out the Odakyu main website. Once you buy your pass you then need to decide whether to upgrade to the Romance car. What is the Romance car I hear you ask? The Romance car is a faster and more comfortable way to get to Hakone-Yumoto. It also goes directly to Hakone-Yumoto with fewer stops. While there is a surcharge of 890 Yen one way for the romance car, you do get your own allocated seat. We decided to take the Romance car on our outward journey. 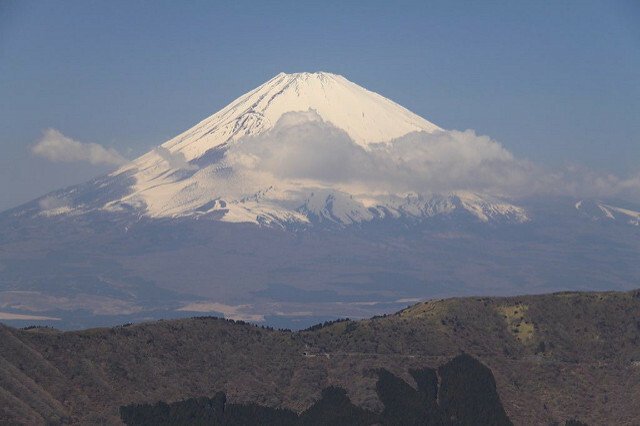 From the train, you’ll see the stunning Japanese countryside and on a clear day, you may even catch your first glimpse of Mt Fuji as you near Hakone. And luckily for us, we did see it but it caught us a little off-guard. Everyone in the carriage started madly snapping photos and in my haste to do the same I got so excited that I almost spilt my coffee over my lap! 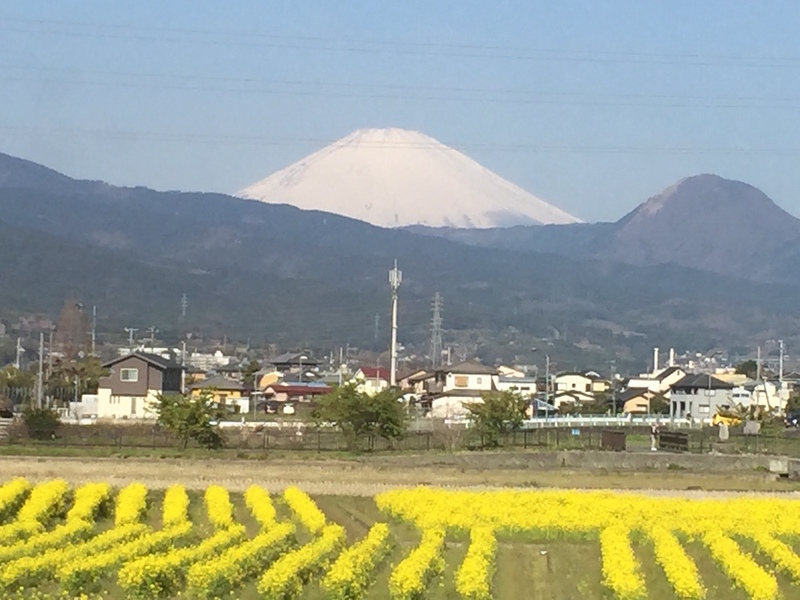 Our first view of Mt Fuji from the romance car! If you don’t want to pay the extra cost for the Romance car, you can take the regular commuter express train to Odawara. That train has no allocated seats, stops more frequently, and can be much more crowded. Once in Hakone-Yumoto station, we caught the Hakone Tozan train, Japan’s oldest mountain train. 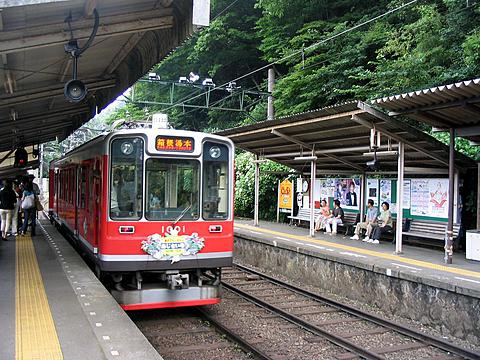 The Hakone Tozan train was designed especially to climb up mountains. This ride was an experience in itself as we ascended more than three hundred meters in altitude up steep mountain slopes, passing through narrow valleys, bridges and tunnels. Half way to Gora the driver and the conductor switched positions and the train doubled back on itself to complete a tight hairpin turn up the mountain. It took about forty minutes from Hakone-Yumoto to reach Gora. That time went very quickly as we were too busy admiring the scenery to watch the clock. If you have time along the way you can stop at some hot springs, or check out the Hakone Open Air Museum which is supposedly quite good. Unfortunately with only one day up our sleeve, we decided to give those a miss. The Hakone Tozan Train to Gora. Photo by Flickr Sodai Gomi. Once in Gora, we took the Hakone Tozan Cablecar that links Gora Station to Sounzan Station Although it only covers a distance of 1.2 kilometres, it travels a very steep slope up the mountain. While you can also hike the route, it takes just ten minutes in the cable car and it would probably be a pretty tough hike to tackle! The cable car offers stunning views but it can get really busy; you might find yourself stuck in the middle of the car unable to take photos. The cable car drops you off near the Hakone Ropeway. Next, we took the Hakone Ropeway from Souzan. 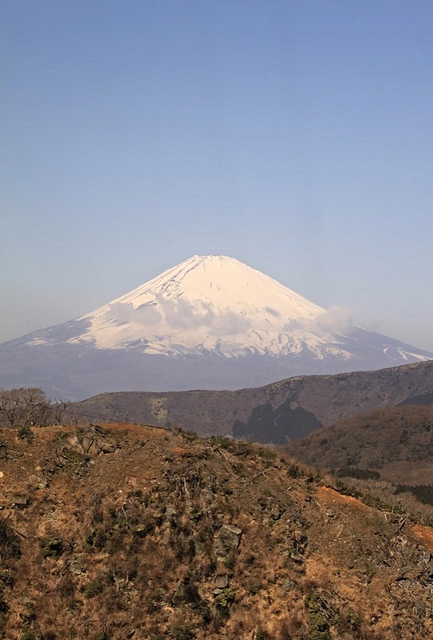 From the Hakone Ropeway, you sometimes have spectacular views of Mt Fuji and the Owakudani volcano, especially on a clear day; and we were really lucky to have one! 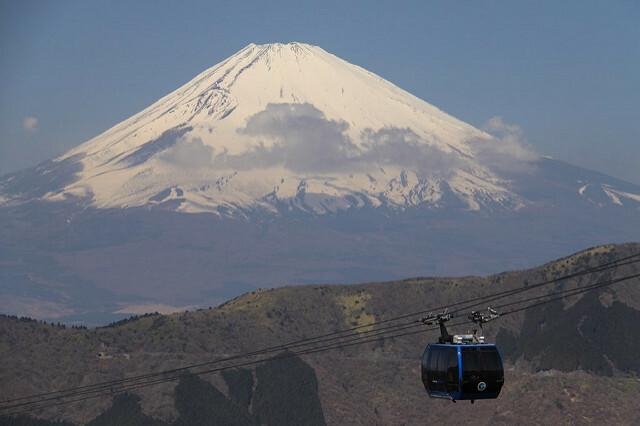 A view of Mt Fuji from the ropeway. 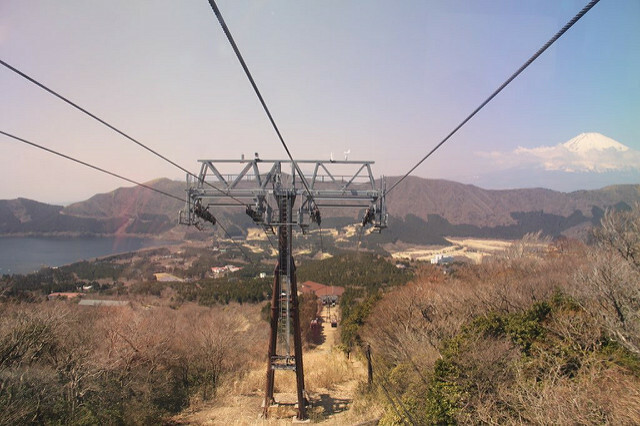 There are three sections to the ropeway. The first section is from Sounsan to Owakudani. In Owakudani you must change ropeways. The two following sections are Owakudani to Ubako and then Ubako to Togendai station. Togendai is on the shore of Lake Ashi. The view of Lake Ashi and Mt Fuji from the ropeway. This section of the trip would have taken thirty minutes if we didn’t spend time exploring Owakudani, but we spent over an hour there! 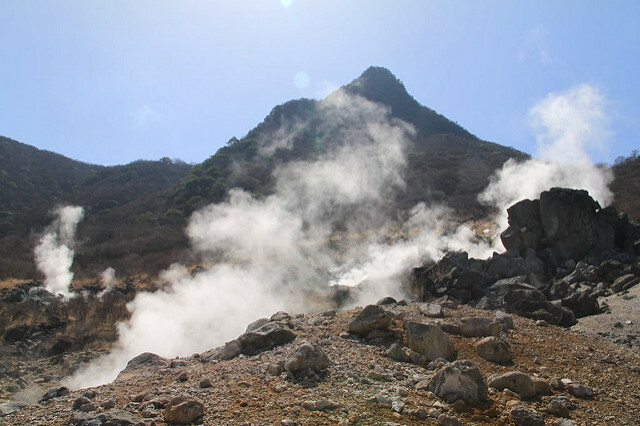 Owakudani is an active volcanic region, complete with sulphur vents, hot rivers and hot springs. One thing you will notice as you exit the ropeway in Owakudani is the unpleasant smell of sulphur fumes. You adjust to it after a while but at first, it’s a bit over-powering. The view of Owakudani from the ropeway. One of the many stem vents. The Owakudani region’s speciality is the Kuro-tamago or “Black egg”. It is an egg boiled in the volcanic hot springs. It turns black and gains a sulphurous smell. Apparently eating one extends your life by seven years. As you walk around Owakudani you will see workers boiling the eggs and sending them back down the hill using a zip-line system. 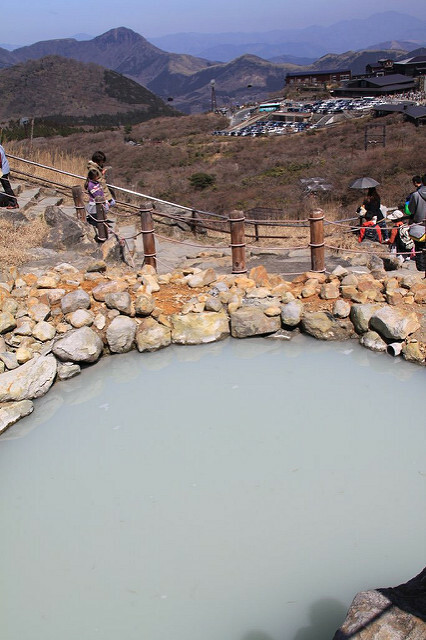 A sulphur pool where they cook the eggs. You can buy the blackened eggs to eat or you can even get Kuro-tamago flavoured ice cream! We were not brave enough to try either so I guess we won’t live seven years longer! 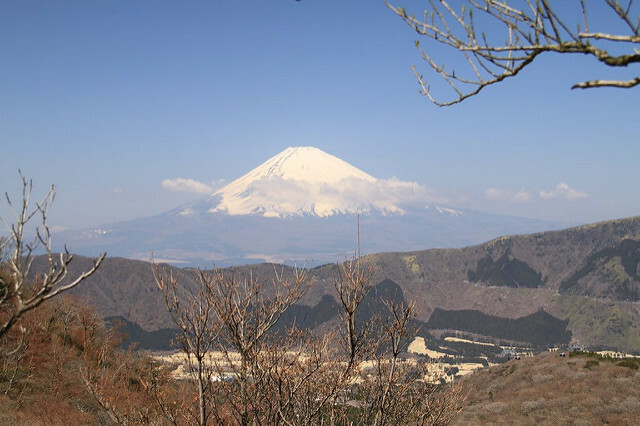 From Owakudani you will also have a great view of Mt Fuji. Once again remember that this depends on the weather. On a cloudy day, Fuji-San might be hiding and you may struggle to see it. The view of Mt Fuji from Owakudani. 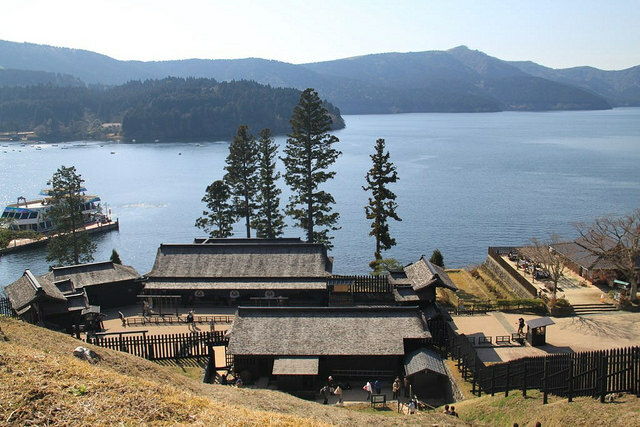 Reaching Togendai Station, you’ll find yourself on the shores of Lake Ashi. 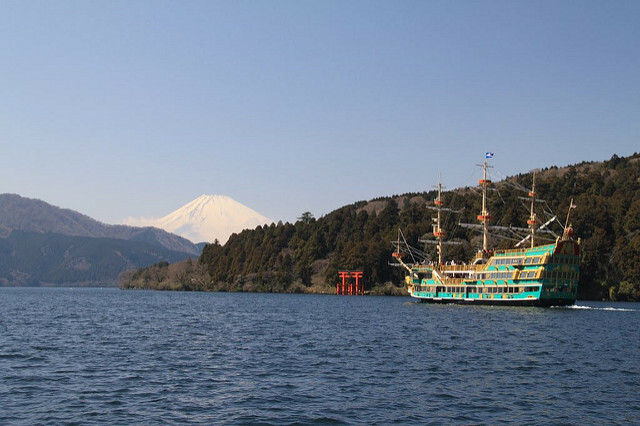 Included in your pass is a boat cruise on the pirate boat that will take you across Lake Ashi to Moto-Hakone-Ko. This cruise is very busy because many organised tours take their guests on it. Although the boat accommodates quite a few people, we couldn’t get on the first one that arrived as it was too full. The cruise departs every thirty to sixty minutes depending on the time of the year. As luck would have it we had to wait a whole hour. The view from the pirate ship. 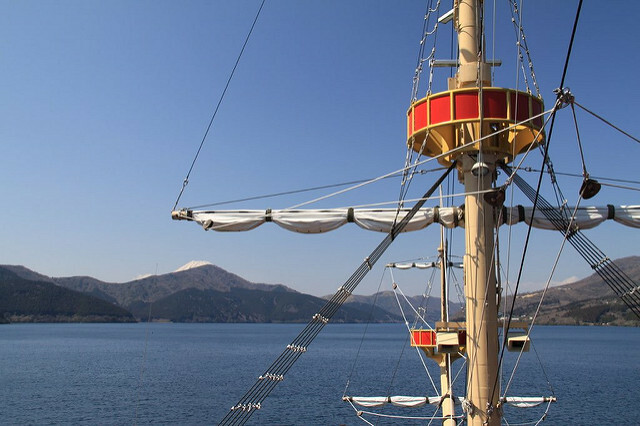 From the boat, you will have beautiful views of Lake Ashi, the surrounding mountains, and again if you are lucky you’ll spot Fuji-San. It’s a lovely cruise but depending on the time of the year it is really cold out on the lake so come prepared! We were there in March and we were freezing! 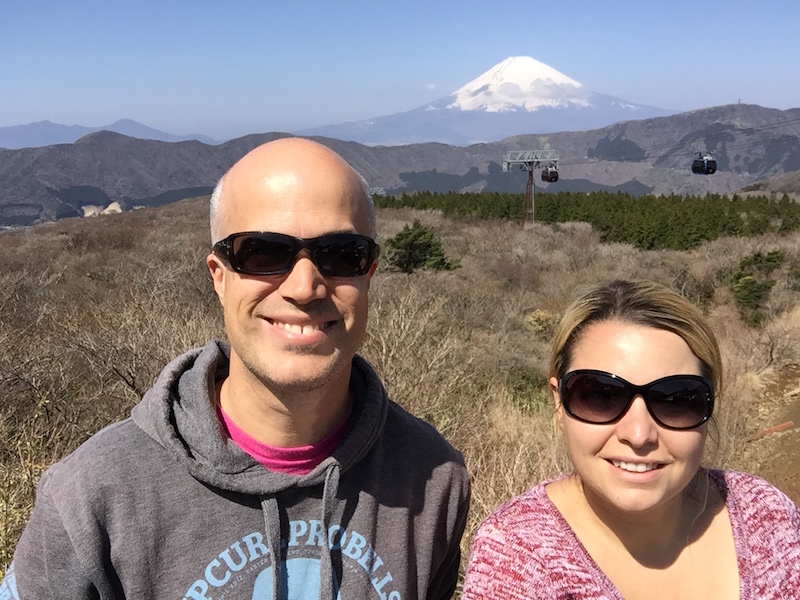 We hopped off in Moto-Hakone-Ko where we again had an amazing view of Mt Fuji with a bright sunny sky. I have to say we were extremely lucky on our trip! From there we walked on the Ancient Cedar Avenue to Hakone Machi-ko and visited Onshi Hakone Park. This was a pleasant park that had some nice views of both the lake and Mt Fuji, together with some very interesting trees. There are a few stairs to climb but the views make up for the extra effort. The view of Lake Ashi from Moto-Hakone-Ko. 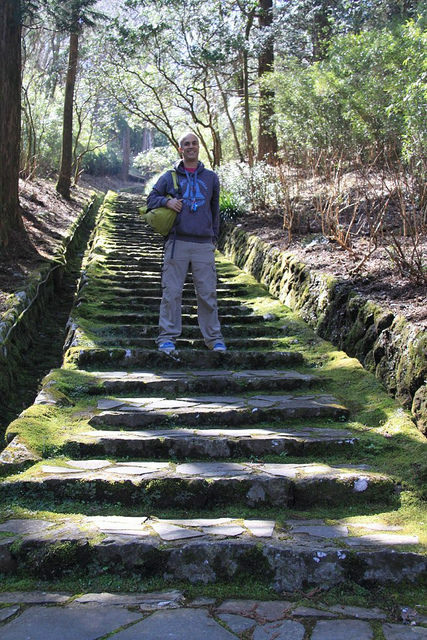 Hiking in the Onshi Hakone Park. Many stairs! A great view from the park! The Ancient Cedar Avenue is an old segment of the Tokaido highway used during the Edo period by people travelling from Tokyo to Kyoto. The tall Cedar trees were grown to provide shade to the travellers. It’s a lovely walk back to Hakone Machi-Ko. Back in Hakone Machi-Ko, our final stop was the Hakone checkpoint. During the Edo period, this was an important transportation and communication checkpoint. It has been restored after one hundred and forty years of neglect with the reconstruction effort being completed in 2007. It is now in its original form complete with some very impressive gates and fencing, a lookout tower, and housing for officers and a prison. It’s a very interesting place to visit. For some more great views (let’s face it we had no shortage of great views throughout the day) climb the stairs of the lookout tower. 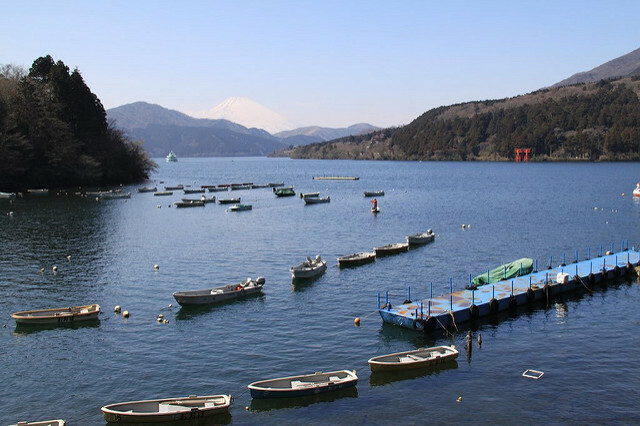 You won’t see Mt Fuji from there but you’ll be able to look out over Lake Ashi and the checkpoint itself. The view from the lookout tower. After a short walk around Hakone Machi-Ko and some obligatory souvenir shopping, we made our way to the bus station to catch the Hakone Tozan Bus. Also included in our pass, the bus took us back to Odawara where we caught the commuter train back to Shinjuku. All in all, this was an action-packed day and we were pretty exhausted by the end of it. Hakone is such a great area to explore; we were lucky to have such amazing weather for our trip and to see so much of Mount Fuji. Arriving back in Shinjuku quite late and not having eaten dinner, we were famished. So we headed over to Yakitori Alley for some well deserved Yakitori washed down with some warm sake. Finally, we ended our long day with a night cap at the awesome Zoetrope whisky bar, sipping some excellent Japanese Whisky. What a fantastic day! That free pass sounds like a handy way to explore this part of Japan! I’ll certainly have to remember that if I ever head to this area! Hi, I would like to know how long you guys spent the day at Hakone area? At what time you started the journey from the Shinjuku station? Thanks! Hi Sophia, We left Shinjuku really early, around 6.30am and left Hakone around 6pm. Hope this helps. Let me know if you need any other infos. Thanks for the prompt reply Cindy! The Hakone Free Pass you purchased on the same day you going to Hakone? Or in advance? The Romance Car is optional right? We bought it a couple of days before as we wanted to start really early. You probably can buy it on the same day but the office probably don’t open till 8 or 9 so you’ll have to start later. Probably best to buy it at least the day before. The romance car is optional and you have to pay extra so if on a budget you can just get the pass and use the normal train. Do you get to choose the seat when taking the Romance Car? Which side of your seat (left or right) when you got to see a glimpse of the Mt Fuji? You do get allocated seats when booking the Romance car so request a right hand side seat if you can. You will still see it on the left if you move but it’s easier to photograph if you sit on the right side. Although bare in mind a lot of the time the view of Mt Fuji is obstructed by clouds so it’s a 50/50 percent chance! Hope you are as lucky as we were. Make sure to check the weekly weather forecast before booking your trip and try to pick a sunny day. Thanks a lot for the info CIndy! Yea, hopefully I will be as lucky as you! Hugs!